One of the questions that I get asked most often, and one that has already been asked in the Facebook group that I set up for the purposes of this book club, is where I got my inspiration for character of John Milton. The truth is that Milton came to me fairly easily. There are a number of reasons why that was the case. The most important one, to my mind, is that I had been working for 10 years in the film industry. My job was to watch films and television episodes and then give them age ratings that were suitable for the British market. In practice, that meant that I watched around 300 films a year, together with hours and hours and hours of television. Some of that was not remotely relevant to what I would eventually wind up writing. However, it’s inevitable that a great deal of it wasrelevant, and, almost by a process of osmosis, I became steeped in influences and ideas that you’ll see in my fiction. It’s probably also one of the reasons that I have never found a problem with writers block. Ideas have always come easily since I started to write full-time. With all that in mind, I thought it might be interesting if I told you a few things about the key influences that I can put my finger on. There are three that come to mind. One of the TV shows that I enjoyed the most during my teenage years was The Equalizer, the US network show featuring the British actor Edward Woodward. It always struck me, from the gritty intro sequence (backed by a superb score from Stuart Copeland of The Police), to the ruthless way in which the protagonist, Robert McCall, dealt with the bad guys, that this was something very different from the fluffier content that I also watched at the time (Knight Rider, Street Hawk, Blue Thunder, Air wolf, et cetera). McCall was a retired intelligence operative who had served in the CIA. He lived in New York, and, by way of an advert in the classified pages of a local newspaper, offered his services to people who felt that the odds were against them. He even the odds in straightforward and often violent ways, meting out justice to those who deserved it. You’ll see plenty of references back to that series throughout the Milton books. One of the most obvious ones, is that Milton’s old C.O. is known as Control. McCall had a similar figure in his life, a previous handler who appeared in the stories and occasionally offered help. For those who haven’t enjoyed The Equaliser yet, I would recommend the first couple of seasons over the latter ones. Woodward had a heart attack during filming, and did not appear extensively in several episodes. Another reference: McCall was often joined (especially when Woodward was ill) by another retired called Mickey. Milton has his own Mickey: Alex Hicks. For those of you who are missing Hicks, he will be appearing in the Milton book that I’ll write after the one that will appear in summer 2018. I received an email not too long ago from one of the writers of the series. His name is Coleman Luck and he was introduced to me by another reader. It was a pleasure to be able to tell him how influential the show was on me as I was growing up, and the effect that it eventually had on my own career by way of the characters that I have created and the stories that I have been telling. I couldn’t write an article like this without mentioning one of the other key inspirations for the Milton series. I have been a fan of James Bond ever since I can remember going to the cinema. I was brought up in the 80s, which means that I cut my teeth on the campy films in the series featuring Roger Moore. But, as I got older, I delved back into the back catalogue and enjoyed the Sean Connery movies and the original Fleming novels upon which those films were based. One of the films that I classified during my career in the film industry was Casino Royale. This was the introduction of Daniel Craig as Bond and I remember that I found it viscerally exciting in a way that I hadn’t found a Bond film before. There is that incredible opening sequence, shot in black-and-white, where Bond and a bad guy go head-to-head in a bathroom. It is extremely violent, and, for the first time that I could remember, it really felt like the blows that each man dealt the other must have hurt. With that in mind, Milton has certainly been influenced by 007. Not so much the Roger Moore, Timothy Dalton or Pierce Brosnan versions, but more the Connery and, especially, Craig interpretations. I’m also a big fan of the novels, although it is fair to say that their misogyny is something of a bum note in today’s more enlightened times. 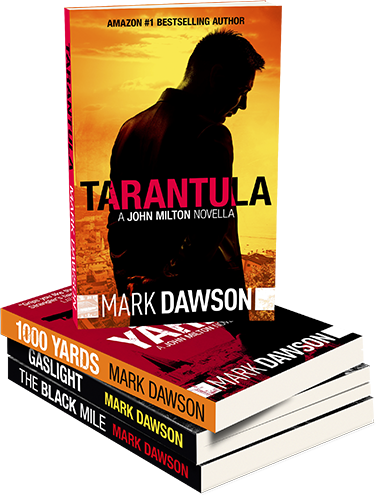 Milton is that kind of character: conflicted, ruthless, and extremely violent when the situation demands it. He, like Bond, is not the kind of man that you would want as an enemy, but precisely the kind of person that you would want as your ally in difficult times. I am sometimes asked by readers how the Milton and Beatrix/Isabella Rose series compare. I see Milton as a gritty Bond, and Beatrix/Isabella as more action packed Bourne-type characters. That’s certainly the way that I consider those competing series when I am writing them. And what about The Cleaner itself? I found the HBO series The Wire to be incredibly influential. David Simon is a peerless writer, both by way of his non-fiction and his screenwriting. Although I didn’t particularly enjoy the fifth and final series of the show, the fourth one, which deals with education in Baltimore, was incredibly powerful. One of the things that I wanted to do in The Cleaner was to reflect the central message that Simon put out in that season; that characters caught in poverty often find themselves swept into a vortex where it is impossible to escape. The young boys in his show often find themselves repeating the errors of the boys that went before them. that’s certainly something that I noticed when I lived in those areas of East London in which the book is set. One of the criticisms that I see repeated again and again in the reviews for The Cleaner is that it ends on something of a downbeat note. I’ll deal with that in a separate post when I will look at the ways in which I made it more difficult for myself when it came to hooking readers with this first book in the series. For today’s purpose, I’ll just say that the ending with regard to the boys who cross Milton’s path could only have been written that way. I’m not a fan of happy endings for the sake of a happy ending. I want my books to be realistic and authentic, and, it would have felt like a betrayal to write the conclusion in any other way. Pinky is quite clearly caught up in that vortex, and I see very little prospect of him being able to escape it. JaJa, on the other hand, has a chance. I decided against making it obvious that he would learn the lessons of his misadventures, but I’m hopeful for him. My view on literature is that once the book is finished and released into the world, the readers interpretation is just as important as the writers. So what do you think? Will he escape? Or will he be dragged back down into the vortex with his friends?